We teach age appropriate curriculum as well as the love of the Lord. We hold chapel weekly where we teach lessons from Bible stories and sing songs of praise. Your child will learn letters, numbers and skills such as the safe use of scissors. Music and art, show and tell and group activities introduce your child socially in an environment where they feel comfortable. 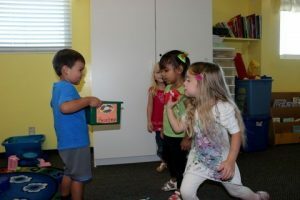 Learning at this age works best with an element of fun and we make sure to include some fun in lessons. Our tree shaded playground is where children can run, climb, ride tricycles, swing, or simply play with sand toys. There is a lot to learn on the playground such as taking turns and cooperation. Of course, the kids think they are just having fun! Circle Time starts the school day. Flag salute, Theme based Bible verse, songs, letter and number recognition games and show and tell. Class time Language arts, fine motor skills such as scissor work, tracing letters and numbers and coloring pictures related to lesson. Art your child will create masterpieces suitable for display on your refrigerator ! Math skills will involve activities like counting, grouping, sorting finding patterns and measuring. Science is always a favorite. Children will discover answers to scientific questions. They will watch a caterpillar become a mature butterfly ready to take wing. Learn why hand washing is so important when they see micro organisms (germs) grow on a petri dish touched by their little fingers. Music and movement activities include singing or dancing to music. Fun movements that go with words of a song. Just For Fun activities include Splash day, Fall Festival, Picture Day, and later Pony Picture Day, visits from community helpers such as sheriff, and firemen. Extra class we have a dance teacher who hold a weekly class at our school. There is an additional charge for this class that is paid directly to that teacher. Ask Sherry for details. Redirection and time out are used for discipline. A time out is given if necessary of ONE minute per year of child’s age. If needed, a meeting with the Director is scheduled to discuss your child’s needs.